Can anyone with construction experience provide anything more than speculation about the purpose of those green pipes sticking out of the ground, all over the construction area? Are they simply location markers or are they likely to be for some kind of drainage as the creator of one of the construction videos kept pondering? Video with commentary from yesterday 11/9/16. The guy admits he has no construction knowledge at all but does his best at speculating. He always seems to end with a short time laps video which is fun. He thinks the vertical green pipes are connected to infrastructure below, but I’m not so sure. I think they may using them to delineate areas for the workers benefit…we shall see. Yeah, that's what I was thinking too, I don't remember seeing them install any deeper lateral pipes and they seem to be stacking a bunch of other pipes that look like they'll eventually become part of the drainage system. These just appear to be being used as markers. I've seen similar pipes used to evacuate underground gases, but I can't imagine that would be a problem here. Last edited by Uncle Bob; 11-11-2016, 02:32 AM. The Mickey audience is not made up of people; it has no racial, national, political, religious or social differences or affiliations; the Mickey audience is made up of parts of people, of that deathless, precious, ageless, absolutely primitive remnant of something in every world-wracked human being which makes us play with children�s toys and laugh without self-consciousness at silly things, and sing in bathtubs, and dream and believe that our babies are uniquely beautiful. You know�the Mickey in us. Did any of you notice that in the Star Wars Update they mentioned that there will be a tunnel that the train will pass through near the back of the FL theater? Do any of you know where they got that info and anything more about it? I'm really hoping that might become a version of rainbow caverns. Yes that is correct regarding the green PVC being use for sewage. What makes me think they are being used for markers is sewer drainage pipes are placed horizontally and slope at 1/4" per foot to keep the effluent moving without the solids separating from the liquids. Generally sewer lines are not placed vertically and what would they possible need so many sewer connections below the Hungry Bear for? I'm pretty sure they are being used as markers. That will be a narrow tunnel that will not allow for any real viable Rainbow Caverns type experience. 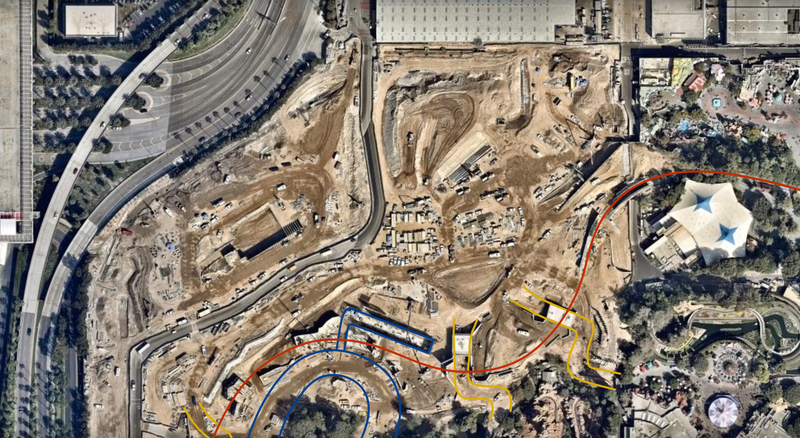 If you look closely at the latest arial view, you can see the formation of where the tunnel will be at the NW corner of the Fantasyland Theater. It looks like it's just needed to block the view of the backstage access road that goes under the tracks in that area. In this satellite photo posted in the MiceChat SWL News Update on 11/10/16 you can see the original tunnel that DLRR passed through at the Northwest corner of the Fantasy Land Theatre directly above the North to South access road just to the west of Toontown leading to the back of the FL theatre. It is my guess that the green pipes are simply the vertical drainage inlets that will feed from curbs and low spots in the pathways. They will be cut off at grade when the time comes. I don't know. There are more of the vertical green pipes around the turn in ROA across from the new point of TSI that look as thought they're very close or even in the ROA at the entrance to the Fantasmic backstage storage area. There aren't any walkways or paths which would not need any drainage...we'll see when they progress further. Our perspectives in the photos and videos are very skewed. Depth is difficult to perceive, and just because it isn't a public area doesn't mean it won't require drainage. Water abatement in a project of this scope is a huge part of the equation. I've been watching the construction progress very closely since the beginning and I don't remember seeing trenching and pipe being laid in those areas. As well if these vertical pipes were for surface drainage they wouldn't be using green PVC sewer pipe which is unnecessary and more expensive for that purpose. I'm thinking they used the green pipe so it's easier to see when used as markers. I'm just guessing with the limited views we have and my experience in construction. I chose my name here "Hammer" because I'm a retired architect and general building contractor. I ran my design and build company for 35 years always on the job site with my crew swinging a hammer. My projects were small commercial and residential in scale so I have limited experience on large projects like this...I'm just giving my opinion of what's going on guided by my personal experience. What I enjoy so much about this thread we can share our speculations and hopefully see if we were correct before the big show building really goes vertical and we can't see any more. Last edited by Hammer; 11-11-2016, 04:34 PM. Time for another satellite overlay. I grabbed this satellite pic from the guy that did the youtube view 11-9 I think it was. As for the overlay I did some investigating by zooming and tweaked the track until it was on top of all the train trestle pillions I could see. Then used the curves to figure out the rest. We know the train tracks have to have smooth radiuses so that helps a lot in figuring out the placement by the landmarks. That seems pretty spot on to me. With two entrance tunnels built, you'd figure the DLRR would go right over the top of both of them. But it did seem awkward for the train to go over the Frontierland Entrance because it would then have to go over part of the Fantasmic! storage - that didn't make sense at all. But those two parallel N/S walls just south of the Frontierland Entrance tunnel line up perfectly to make a nice bridge there. But then, what's the point of the Frontierland Entrance tunnel if nothing goes over it? I guess they will just landscape or put a berm or maybe some rock work on it? 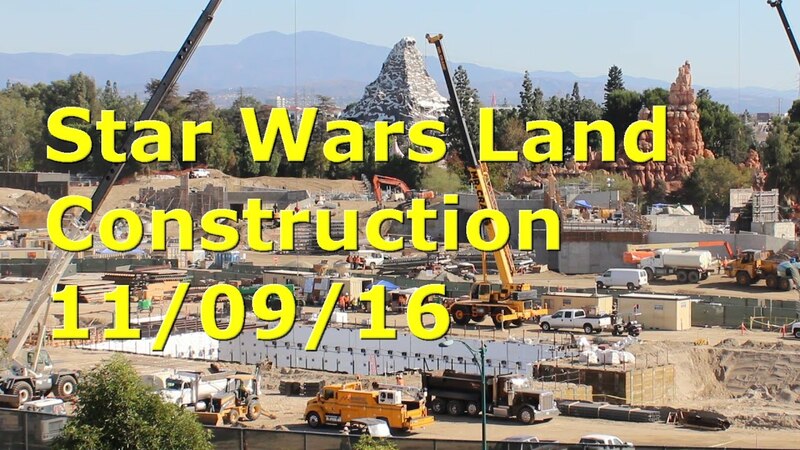 Also, I wonder if there will be anything in between the DLRR and what they call "The Great Wall of Disney"? The Critter Country Entrance will take guests behind that great wall, but there is a lot of space between DLRR and that wall. And it looks like low ground. Could the possibly let the waters of ROA flow into that area and have a lake surrounded by AA animals or something? Of course, the DLRR cars that face in wouldn't let guests look that way. I don't know. We're all just guessing here...I really enjoy the different ideas and points of view from everyone in this thread. The mystery of the vertical green pipes may or may not be solved before our view from the parking structure are obscured. Not to belabor the subject of the mysterious green pipes too much more but I will add a few more observations. I just went back and watched one of the recent videos again. There are a few piles of green drainage pipe laying about on the site, so they are obviously in current use. I believe they ARE being used as markers. They are marking where the installed drain lines are and that is why they have been left so tall. This will hopefully prevent the tractor drivers from driving over and crushing them. If you look over by Hungry Bear, the pipes stick up out of the ground in a pretty straight line, along what appears to be the future edge of the walkway. That is consistent with curbs and runoff traps. Also, where you see them sticking up much higher, remember that we don't know what is going above any of this just yet. These could be drain lines for upper areas or roofs we haven't seen yet. It's a lot easier to keep debris out of lines when the open ends are up out of the way. I'm sure you know, Hammer, that grading markers are tall stakes with flags of various colors, set by the survey crew. Those are also prevalent throughout the site. From personal observation, I do know that green line is used for patio drains and the like, having seen it installed for this purpose many times. You can often see the green pipe if you look into a recently installed drain. I doubt the added expense of green pvc is going to deter Disney from using it for any kind of drainage. It also makes it much clearer when doing future excavation what you are working with. Red or Red striped is electrical. Orange or orange striped is data. Green is drainage AND sewage. Blue or Blue striped is potable water. Purple is reclaimed water, irrigation and slurry and now fire suppression, required in new homes in many places. Yellow is fuel. Even though we may not have seen all of those specific colors, they can also be just stripes on the sides of white or gray lines. 3:30: Rockwork continuing on the Big Thunder Trail side of the Fantasmic backstage storage area. 4:50: Utility conduit being installed behind the Hungry Bear under where the DLRR will emerge. 7:20: Looks like steel structure for rockwork is being installed looking from Critter Country. 8:00-11:15: Another view from Critter Country there appears to be horizontal forming for where the DLRR will pass over a trestle. 11:50: A view from Big Thunder Trail, I wonder why the air pressure hose it attached to the top of the rock formation…possibly to test the mechanism for that top rock to move? 12:43: More very interesting rock formations as viewed from Big Thunder Trail. I originally thought 'why couldn't the train go over the F! storage? It seems that the roof of that storage structure is the same height as that of the entrance tunnels.' However, for the tracks to swing north soon enough to cross directly over the Fronteirland entrance, they would have to swing away from the river a lot sooner than what's depicted in the layover. Since all of the concept artwork - which seems to be an accurate depiction of what's being built, so far - shows the DLRR following most of the northern edge of the RoA, it couldn't turn away that soon. So, I think that this is pretty accurate and that we'll see the trains travel over a wooden bridge, similar to the one in Pooh Corner, just south of the entrance to SWL. On the other hand, what I'm not sure is accurate is the indicated northwest edge of the RoA. If you look at some of the overhead drawings provided by Micechat - whiich have also turned out to be pretty accurate, so far - they show the north end of the river as much more angular than round and the left edge cutting a lot closer to where this overlay shows the DLRR path. Thanks for a new video! At around 2:50 you can see more rockwork taking shape. This structure appears to be on the viewing side of the DLRR, probably separating the raised track from the sunken Big Thunder Trail / Star Wars Entry walkway below. I think the train will be traveling on the close side of the new rocks at that point. I am sure the desire will be to reopen Big Thunder Trail at that same time that the DLRR and ROA are reopened, so all of that scenic work is underway as well. At about 4:00 you can see what I am going to surmise are notches in the concrete walls over which a train bridge will be built. 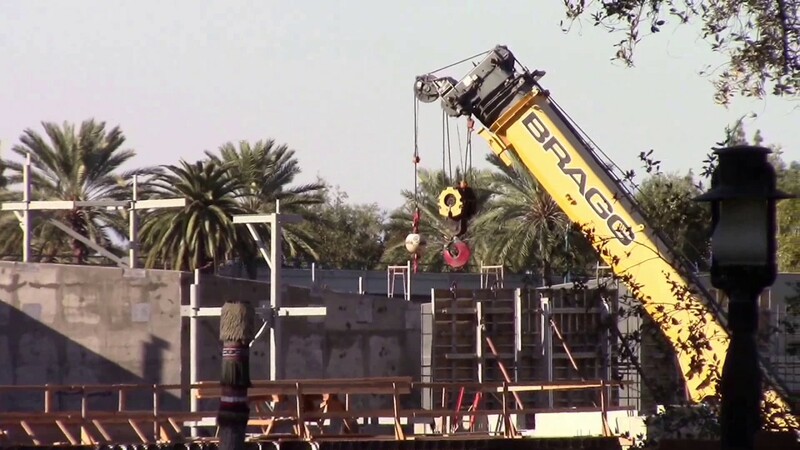 I believe the portion in front of the orange manlift in the shot is the entrance to the Fantasmic marina with stone work lining the two sides, so the bridge will span that entrance. We can only see the other side from this vantage point. At that point the train nearly parallels the marina wall so we are looking down it the long way. The wall with the rag laying on it is the close abutment and the wooden railing is across the far one. I am also going to take a guess that the canoe dock will have a new exit path that leads directly onto the new walkway in front of Hungry Bear. At about 5:30 you can see the relationship of the dock to the new walkway location and if perspective is not throwing it way out of whack, it looks like those will connect, perhaps for ADA access only.